Welcome to the Snowball site. 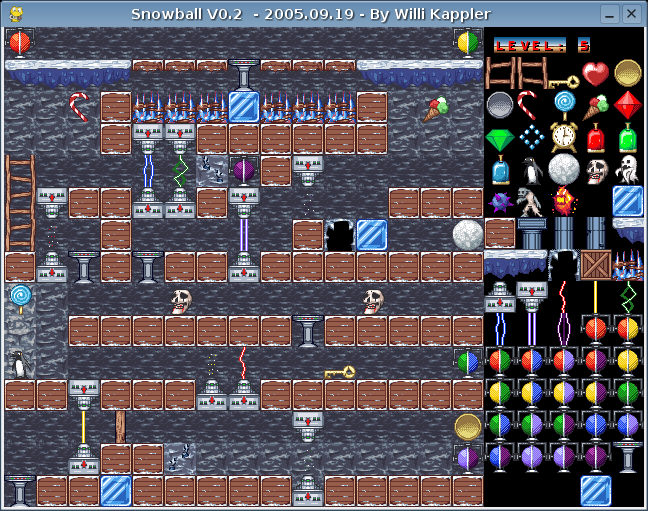 Snowball is a free (GPL) jump'n'run game inspired by games like "Solomon's Key" or "Spherical". 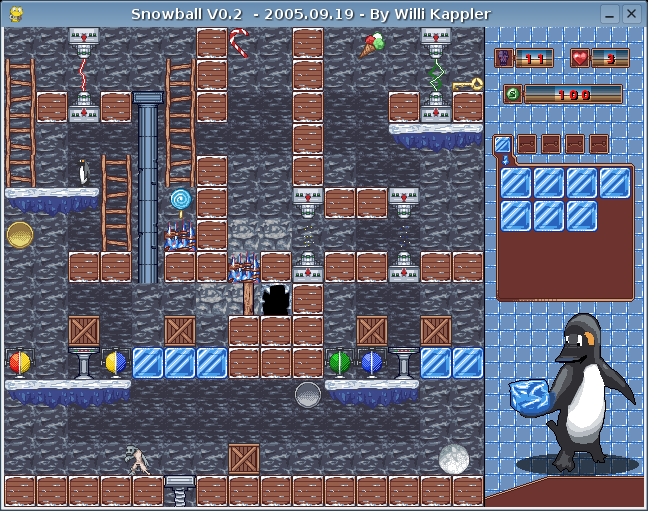 Guide Tux the penguin through the levels and help him to bring the snowball save to the exit. Create iceblocks, collect keys, use transporters and beware of traps and monsters! After finishing my diploma thesis, I'll go back and finish it! The next version V0.3 is on the way! Code clean-ups, more levels, better sound and other goodies, so stay tuned! And I'm very happy to announce a new member in our team: Adam Howard. He has joined as graphician and is working on new and nasty enemies! Some people have reported problems on MacOS, that I have to investigate. So I'll release a version 0.2.1 before the next big one. New version is out! Snowball V0.2 is finally released. Go and get it, while it's hot! It has 20 completly new levels. A lot of changes: completly new graphics, made by Anthony Chau. The next release V0.2 will be out soon. It took a bit more time, sorry for the delay. 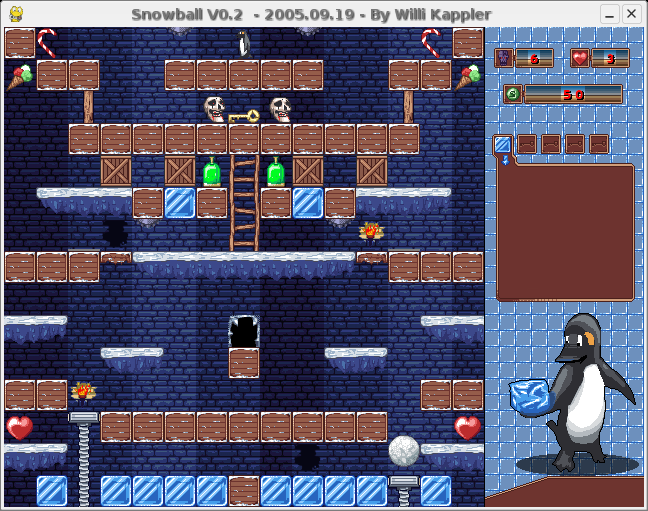 Georgik from games.linux.sk has added Snowball to the database. It's rated with 85%, nice! Finally I found a graphician: Anthony Chau. He's working hard and the result looks really nice, thanks Anthony! I'm adding new objects and enemies and also cleaning up the code. Expect a new release (V0.2) in a week or two. I need a good graphician, so if you are an artist and want to help out, just contact me: grandor at gmx.de. Get the game here. You need python and pygame. 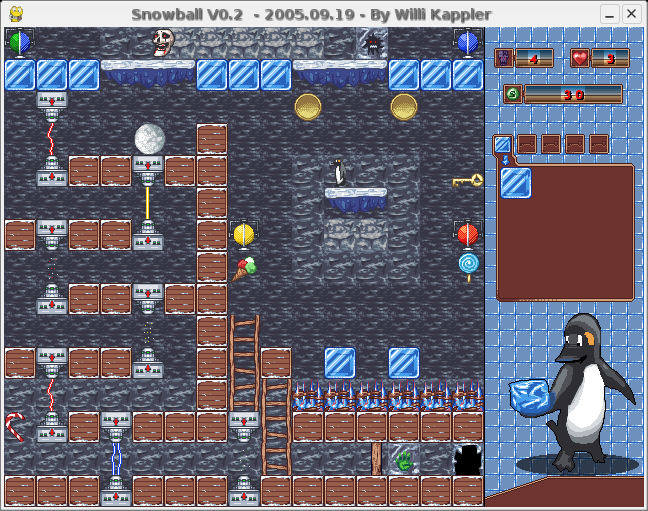 Just unpack the tarball start "snowball.py"
The game should run on all platforms that are supported by pygame (Linux, Windows, MacOS, etc.). I've tested it only on Linux (Kubuntu) and Windows 2000 / XP. Run Snowball with the following command line: "artsdsp ./snowball.py"
Set the SDL_AUDIODRIVER environment variable: "export SDL_AUDIODRIVER=artsc"
Disable artsd completly: "killall artsd". The old version (V0.1) is here. Some in-game screenshots, click to view the big version. Code, Design: Willi Kappler (grandor at gmx.de). GFX: Anthony Chau (pyrofactor at gmail.com) and Willi Kappler. SFX: Willi Kappler and externalharddrive.com. Special thanks to Thomas Grosser for the webspace!